Our range of English Upholstery is handcrafted by skilled craftsmen and includes Victorian Style Button Backed Armchairs and 2 Seater Sofas; Chaise Longues; Double Ended Chaises; Window and Elephant Seats; Fender and Table Stools. A choice of materials is available for viewing in the shop or can be viewed on-line on our samples page (colours may vary slightly) or you can supply your own. The turned legs come in Mahogany, Beech or White finish. The Chaise Longues are made left or right handed and come in 4ft, 5ft and 6ft lengths. 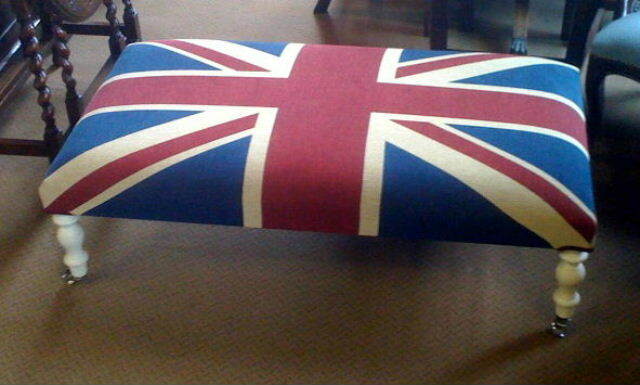 This seasons must have is anything in Union Jack, watch the football, cricket or Olympics in true patriotic style sitting on one of these. More Union Jack items below. Legs - Mahogany on brass castors. The female chair has smaller arms. Legs - White on silver castors. Legs - Beech on brass castors. Legs - White on brass castors. Legs - Beech no castors. POA Single musicians chair in a red and gold fabric. One available.